Carefully trying to pick my way across a marsh, I sink into a deep pocket of mud up to my shins. 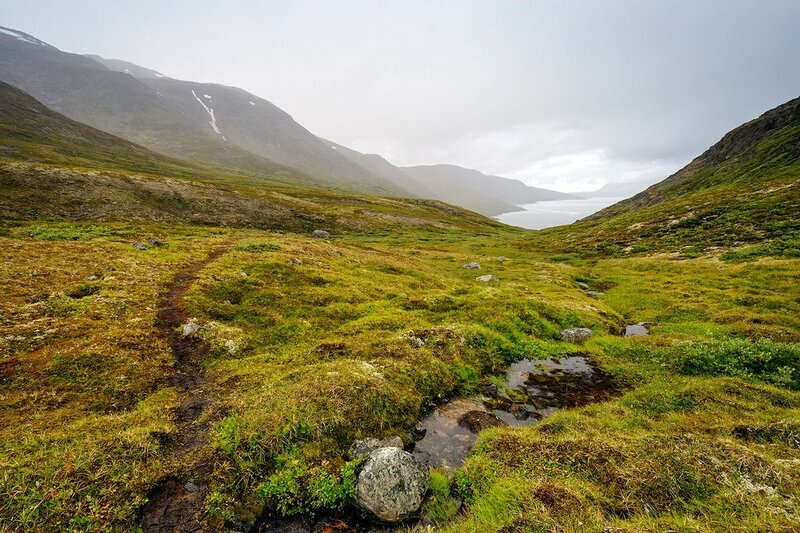 This wet terrain is a regular hazard on the Arctic Circle Trail. The Greenlandic morning is dark & wet with heavy fog at 8am when I begin packing my gear for the next leg of the Arctic Circle Trail. Luckily most of the day will be hiking downhill out of the mountains. Stuffing dry kindling from my failed fire attempt under a rock for the next hiker to use, I gradually make my way into a valley lined with small lakes and cotton grass blowing in the wind. Eventually the fog clears and I spot reindeer grazing in the hills beside me. Then another arctic hare. There are so many wild animals roaming Greenland! Nerumaq hut is not far away, and I stop to take a short nap due to lack of sleep the night before. Today will be a long day on the trail and I’ll need all the energy I can get. Moving quite fast now, at this pace I should finish by tomorrow evening. My backpack is exponentially lighter having eaten most of the food I began with. 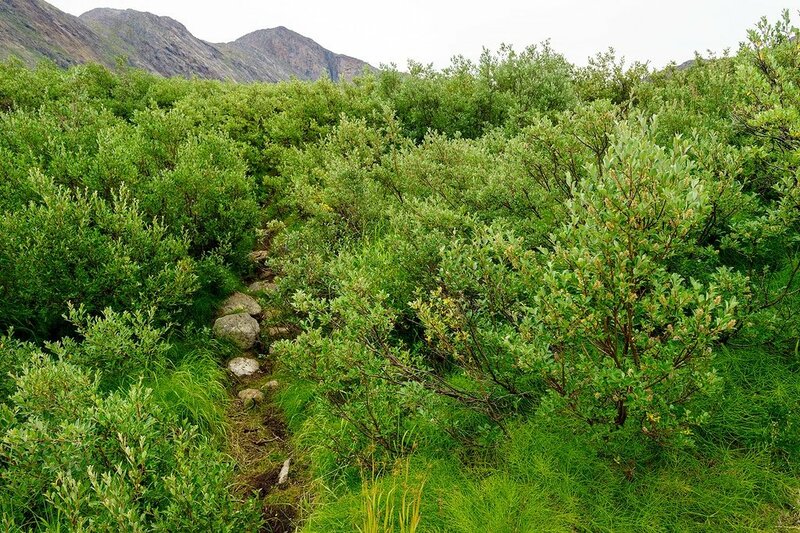 The Arctic Circle Trail threads through a patch of dwarf willow trees, the tallest are only about 6 feet high. It’s the largest forest I’ve seen since arriving in Greenland last week. Trees don’t grow well in the arctic tundra. More and more rivers snake their way down from the mountains across my path, some with small waterfalls. Most are easily crossed by rock-hopping. The trail becomes wet & swampy again. The weather worsens. In fact now it’s raining. I still haven’t found the next hut. Fog moves in and the sky darkens. While I’d love a dry place to sleep tonight, it looks like I’ll have to pitch camp in the rain. I curl into my sleeping bag and snack on dried fish — washing it down with the last of my potent Greenlandic schnapps in an attempt to stay warm. The next morning I prepare for what will hopefully be the final day of trekking. Right away my feet are sucked deep into bog mud, up to my shins. Not a good way to start! Climbing a hill I soon discover the Tulleq hut I’d been searching for the night before. Ahhhhh! Only 10 more minutes and I would have enjoyed a solid roof over my head. The trail rises back into the mountains through a high rocky valley, with views of snow covered peaks on either side. I find the remains of dog sledding equipment scattered about. Hiking through boulder fields alongside a small river, crossing it a few times before coming to a wide open valley called Nasaasaaq. Jagged mountains can been seen in the distance. Trekking down into this beautiful valley, I spy something large, shaggy, and brown moving across the trail. It’s a musk ox! The musk ox is Greenland’s largest land mammal weighing up to 400 kilos (880 lbs). These huge shaggy creatures are related to goats, but look more like buffalo to me. I watched a group of them from a distance earlier that week, but this bull was only 50 yards away — blocking the path ahead. 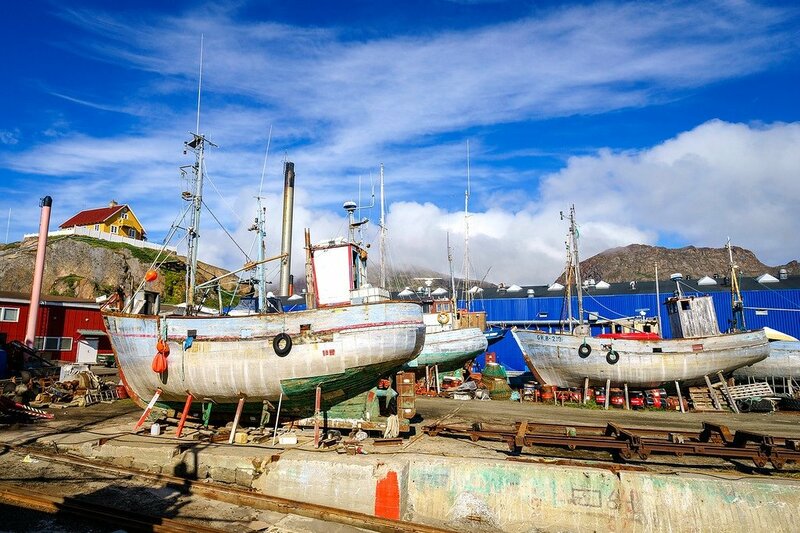 The Greenlandic name for them, Umimmak, means “the long-bearded one”. 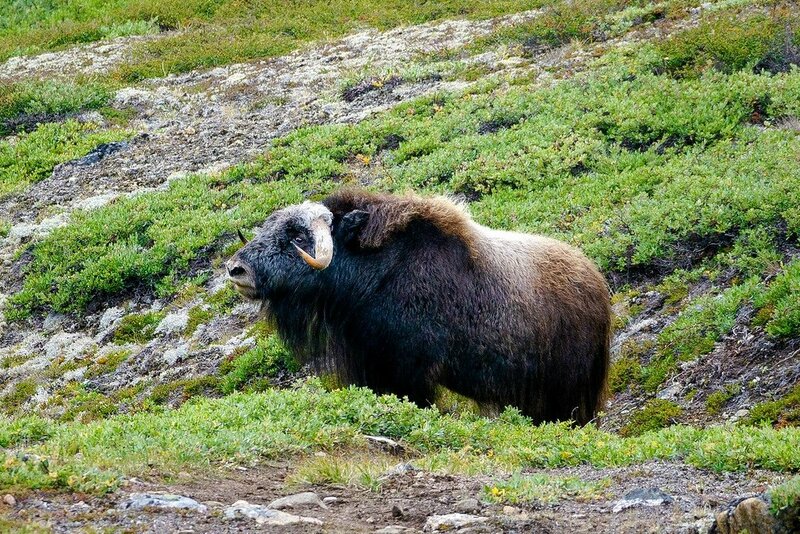 Musk oxen are an important source of meat and wool for native Greenlanders. You have to be careful not to get too close or they can charge. Eventually this one smelled me & ran up a mountain. I don’t blame it. After passing an out-of-place ski lift, I round a corner to find the Arctic Ocean. 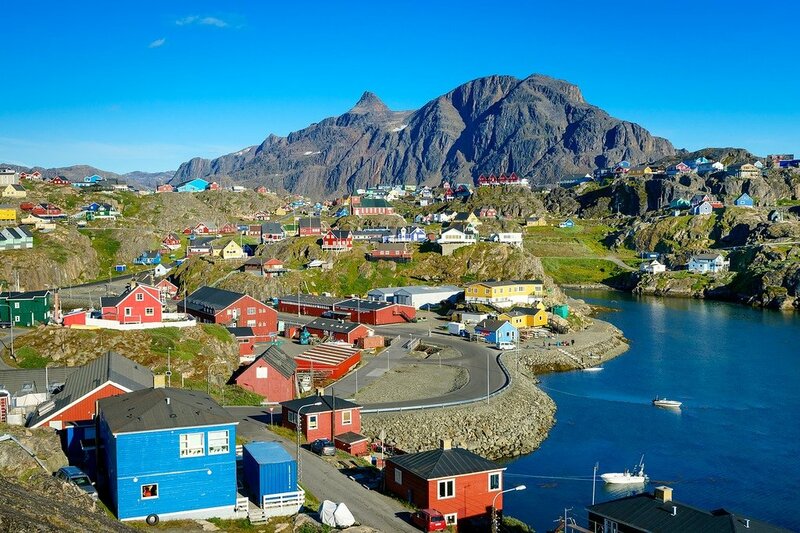 Perched on the edge is the colorful fishing town of Sisimiut. Success! I made it! I hike into town past hundreds of barking sled dogs feeling on top of the world. My feet ache. My body is exhausted. Yet I can’t stop smiling. 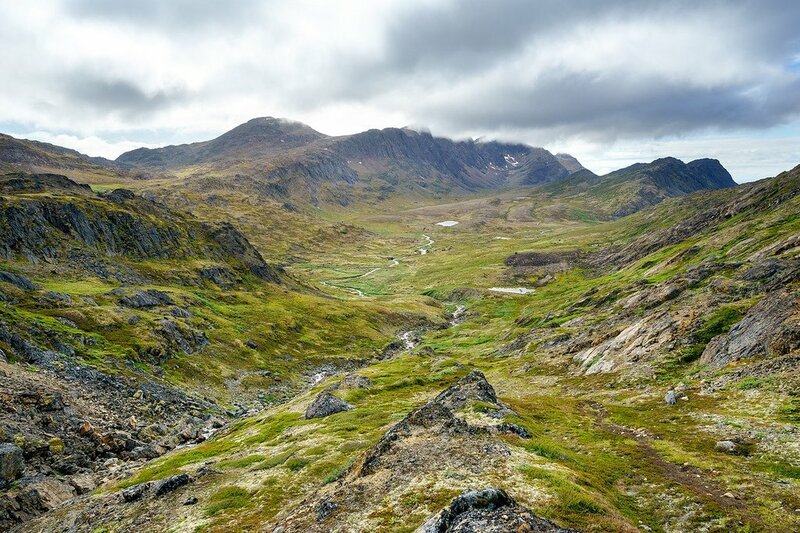 Trekking for 10 days across the Arctic Circle Trail in Greenland’s wilderness was a rewarding adventure travel experience. I’d lived off the land eating berries & mushrooms; saw all kinds of cool wildlife, camped under the stars, and spent time alone with my thoughts surrounded by nature. It was my personal version of Into the Wild. To celebrate the end of my long journey I checked into a fancy hotel, boots still caked in mud. Jumping into a hot shower for 20 minutes with a cold beer. Followed by a delicious musk ox steak dinner with Greenlandic coffee. Damn it felt good to be back in civilization! The next 4 days were spent walking around Sisimiut, hanging out with other hikers & a group of theater actors from Norway & Denmark. We danced to Greenlandic hip hop & learned about Inuit culture. 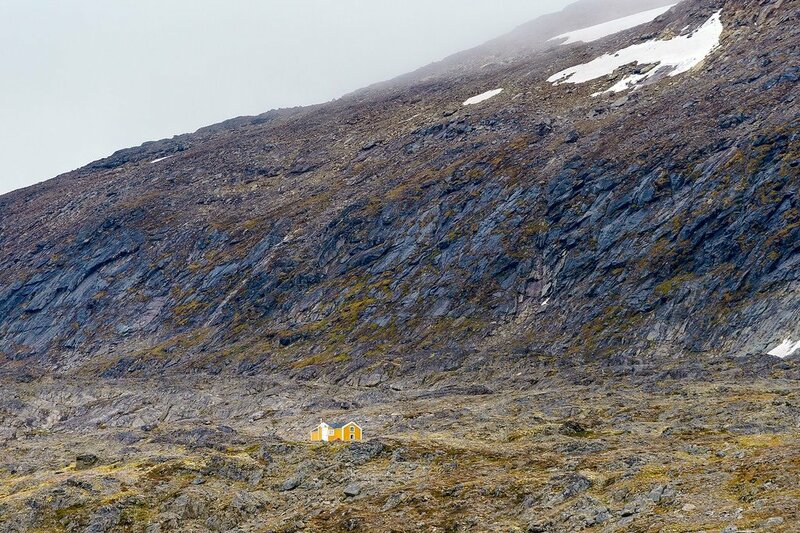 Have you ever wanted to travel to Greenland? Did you enjoy these articles? Let me know in the comments below! Hi Matt, great stuff! Love the photos too. One question about your day 9 and day 10. You seem to stop day 9 at one place and start day 10 at another. Is that right or is the plan missing one day between? I was wondering because there seems to be about 24km between these places. I am fully inspired now. These photos are breath-taking and a trail with no-one else, sure we had a great time. I envy that naked river crossing part, that must be cold. I was thinking of July, till I read about mosquitos. Thanks for sharing your experience. This trip is now on the top of my bucketlist!! This trail is going straight onto my bucket list!! It looks absolutely stunning, thank you heaps for introducing me to this one! 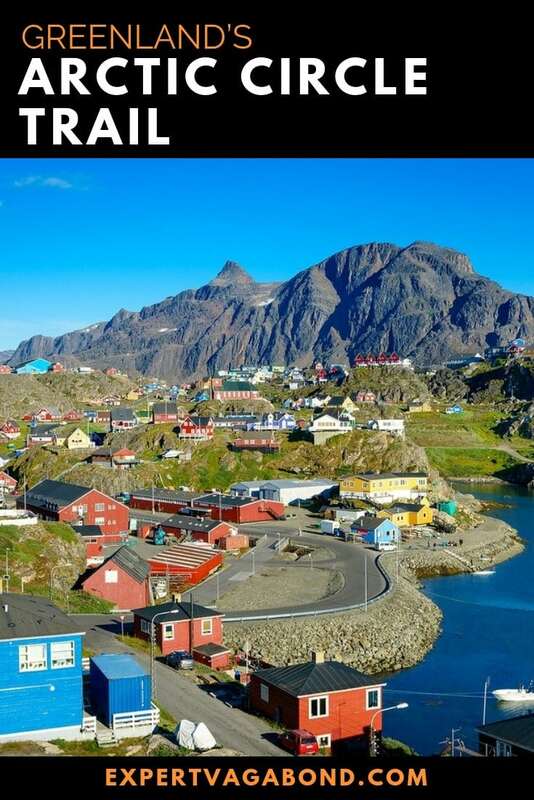 Greenland is a country I’d really like to explore and this hike looks phenomenal! Oh wow, what a place to hike! 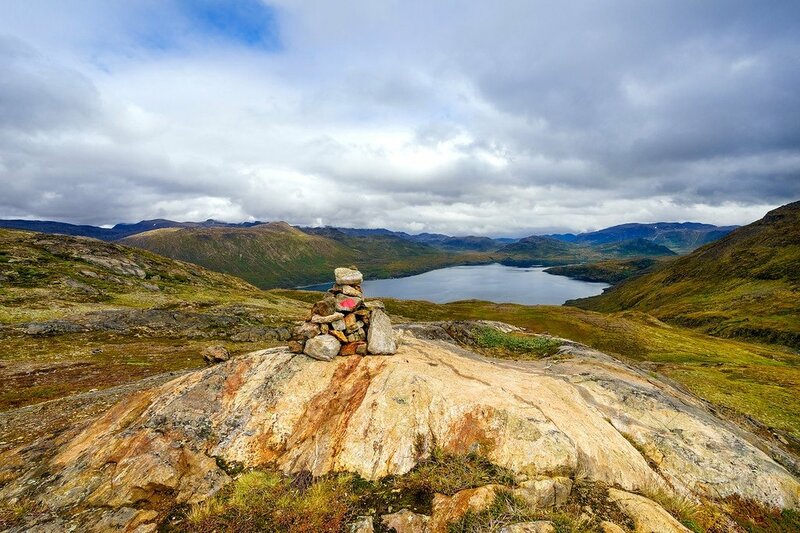 I’ve never heard of the Arctic Circle Trail before but it’s gone right on my bucket list thanks to this. My ultimate bucket list adventure is to visit the North Pole and South Pole, which is probably a bit out of my reach, but I reckon this would be doable. Your photos are stunning, I would love to see that scenery with my own eyes. Great article – I’ve read it through 3 times so far ! Although I’m 57 with bad knees, and only took up serious hiking 3 years ago, I currently hike ca. 50-70kms a week and this looks perfect for me for late August 2017 (I’ve a Nepal trek first in the Spring – since it’s much closer to my home in Shanghai). Your Greenland post is inspirational and now I can’t wait to get to the glacier to start ! How did you get back to your starting point in order to get a flight back to Denmark or did you get a flight from the East Coast? I am interested in doing the trek next year. I just hiked ACT now in August, and want to thank you for the most elaborate and entertaining piece of information I could find on the trail in advance. Your blog was very helpful indeed in my planning of the hike. Just a note on safety: As always, it’s important to check locally about safety issues prior to hiking. This year there were two polar bear sightings south of Nuuk in early August, but I was reassured by local authorities (WOGAC at http://www.wogac.com and by the police (ph:+299 841222)) that there was no need for alarm. And as it turned out, rightly so. Historically, there have been rare incidents with “lost” polar bears both around Kangerlussuaq and Sisimiut, but that should definetly not be reason enough to scare people away. My highlight in terms of wildlife was an encounter with two muskoxes by the river bank at Oles Lakseelv, about half way on the trail. They appeared just on the opposite side of the river while me and my friend were fishing, just 30-40 meters away !! They ran away after half a minute of a staring contest, and banged their heads together after they reached safety. Great moment ! Again, thanks a lot for your meticulous blog. Good luck with future travels ! Great to hear Yngve! Glad you enjoyed the trail. Such a beautiful and unique experience. Absolutely spectacular! And the trail sounds doable, unlike a full fledged expedition or something. Thanks for these articles, I’m strongly considering hiking the Arctic Circle Trail after reading your posts. What’s the wildlife situation though? Any chance of scary encounters? You just have to keep your distance from the Musk Oxen, they can charge if you get too close. No polar bears to worry about on this side of Greenland. Many thanks for your hiking blog – I really enjoyed it, and just may do that trail some day! Your photos and the video are beautiful – what camera did you use? Ahhh it looks every bit as dreamy as I imagined it to be! Hi there, what sort of resources did you use to prepare for this trip? I’d like to do it late August 2016 and would like to read and prepare as much as possible. Also, did you ever find it difficult to follow the trail or was it well marked/obvious? Amazing experience. Indeed places like Arctic and Antarctica are unique. You had a great adventure. The video is so inspiring… Thanks! greetings from south Morocco. Hey Nick! Glad you enjoyed the video. Gives you a slightly better look at the experience over just photos. I think the Arctic Circle Trail will become more popular over the next few years. A wonderful hike. Thank you so much! This has actually inspired me to do the trail in the next year or so! I’m looking forward to reading about your preparation! Great post and photos, but the one of Nasaasaaq Valley looks like pulled straight from some fantasy book or movie; amazing. Also, I’d never heard of musk oxen. Do you know if they are an endangered species? Nope, there are tons of them. It’s current conservation status is “Least Concern” according to Wikipedia. Greenlanders regularly hunt them along with reindeer to feed themselves. Musk Ox steak is a common dish in Greenland. Very tasty! 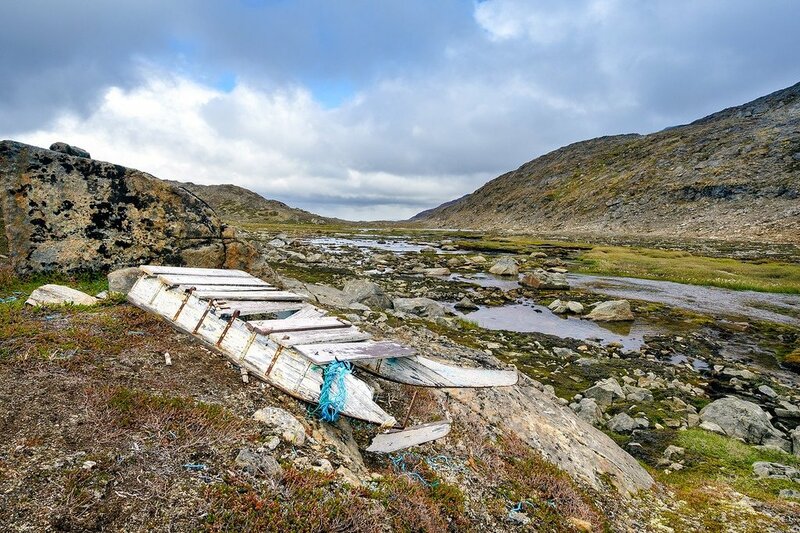 So much to discover about Greenland. I have such a great time reading this series of posts. I didn’t think about visiting before… now I have changed my mind. That’s what I like to hear Laura, that my articles & photos inspire other people to travel somewhere new. 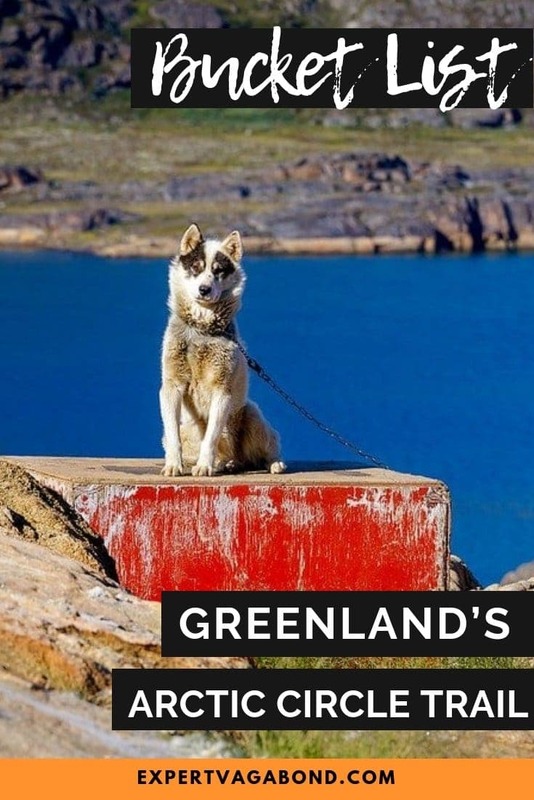 Let me know if you end up visiting Greenland! Absolutely inspiring! Thank you for sharing this. No problem Craig, glad you enjoyed it. LOVE the video!! 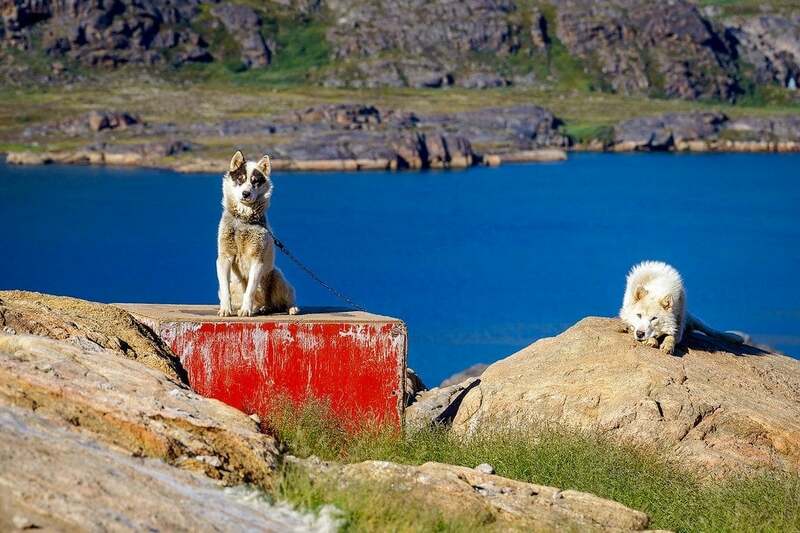 Had no idea that Greenland was so beautiful-thanks for sharing your trip!! 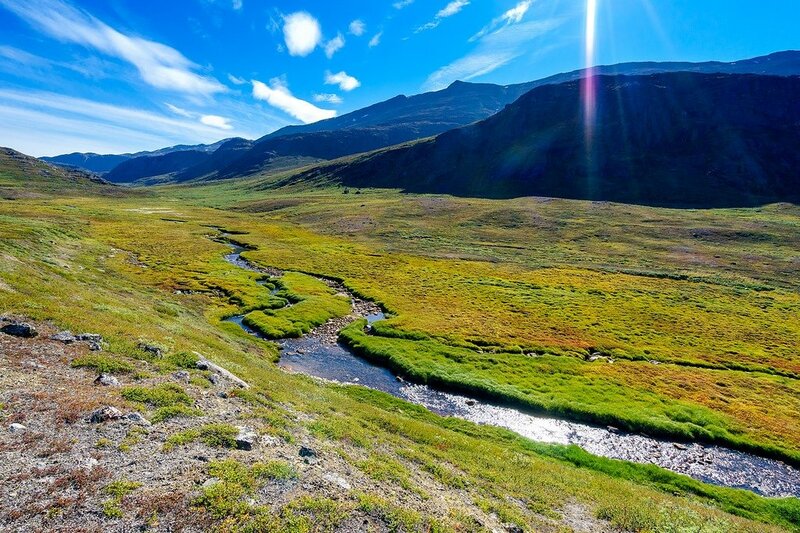 Greenland is greener than you’d think.